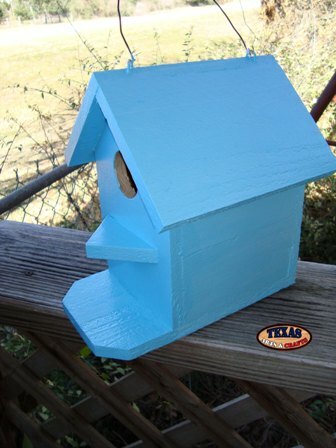 We build the Texas Pastel Bluebonnet Bird House in our workshop out of cedar. The whole bird house is hand painted light blue. 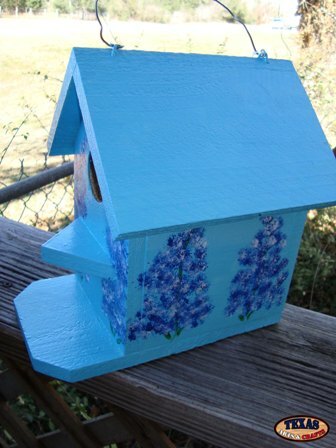 Bluebonnets are painted onto the sides of the bird house. The size and colors may vary slightly as the bird house is handmade. Some of the birds that will nest in this box are American Kestrel, the Great Crested Flycatcher, Wrens, Chickadees, Nuthatches, Titmice, Swallows, and Woodpeckers. The dimensions are approximately 10.50 inches tall by 5.50 inches wide by 9.50 inches deep. The bird house weighs approximately 3 pounds with packaging. For the continental U.S. shipping and handling is included in the listed price. For shipping outside the continental U.S. please contact us through our Contact Us page. We build the Pastel Sunflower Bird House in our workshop out of cedar. The whole bird house is hand painted light green. 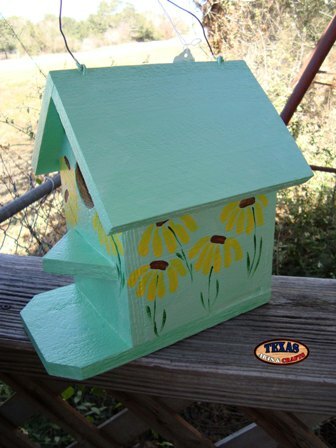 Sunflowers are painted onto the sides of the bird house. 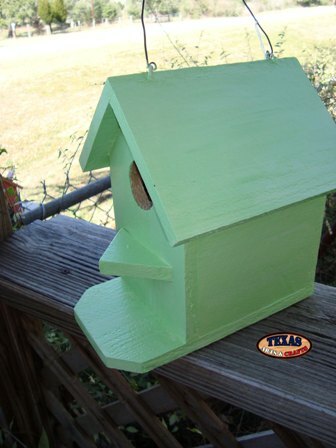 The size and colors may vary slightly as the bird house is handmade. Some of the birds that will nest in this box are American Kestrel, the Great Crested Flycatcher, Wrens, Chickadees, Nuthatches, Titmice, Swallows, and Woodpeckers. 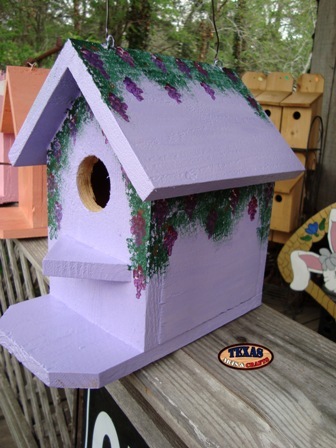 We build the Pastel Purple Flower Bird House in our workshop out of cedar. The whole bird house is hand painted light purple. 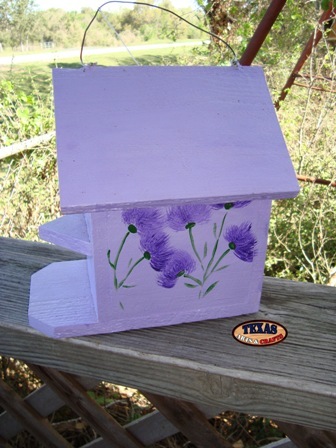 Purple flowers are painted onto the sides and front of the bird house. The size and colors may vary slightly as the bird house is handmade. Some of the birds that will nest in this box are American Kestrel, the Great Crested Flycatcher, Wrens, Chickadees, Nuthatches, Titmice, Swallows, and Woodpeckers. We build the Purple Vineyard Bird House in our workshop out of cedar. The whole bird house is hand painted light purple. 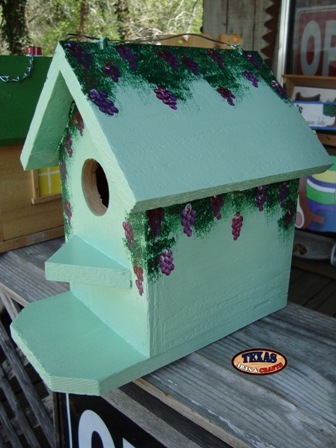 Dark green vines with purple grapes are painted onto the sides, front, and roof of the bird house. The size and colors may vary slightly as the bird house is handmade. Some of the birds that will nest in this box are American Kestrel, the Great Crested Flycatcher, Wrens, Chickadees, Nuthatches, Titmice, Swallows, and Woodpeckers. We build the Green Vineyard Bird House in our workshop out of cedar. The whole bird house is hand painted light green. 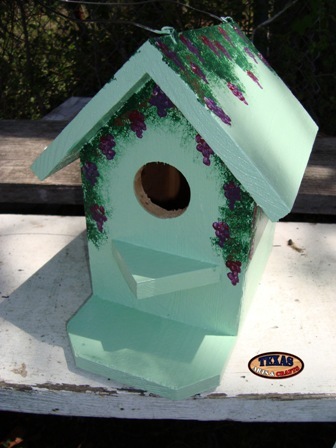 Dark green vines with purple grapes are painted onto the sides, front, and roof of the bird house. 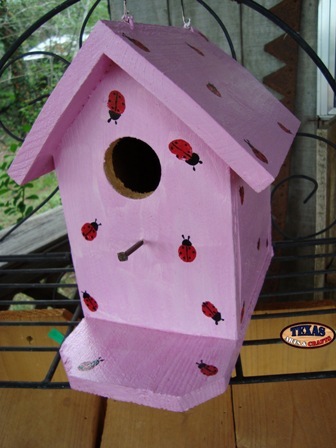 The size and colors may vary slightly as the bird house is handmade. Some of the birds that will nest in this box are American Kestrel, the Great Crested Flycatcher, Wrens, Chickadees, Nuthatches, Titmice, Swallows, and Woodpeckers. We build the Ladybug Bird House in our workshop out of cedar. The whole bird house is hand painted light pink. 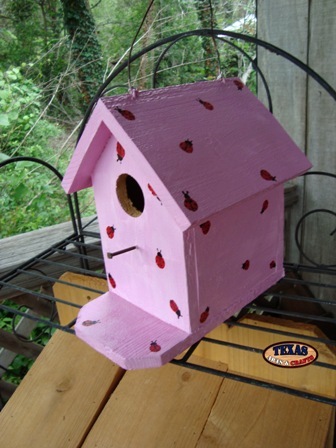 Little ladybugs are painted onto the sides, front, back, and roof of the bird house. 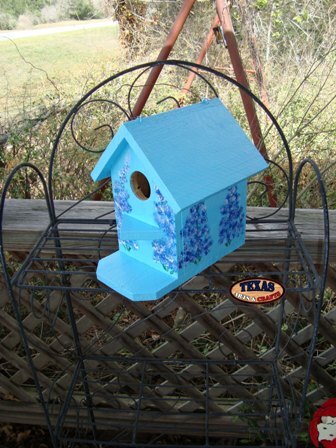 The size and colors may vary slightly as the bird house is handmade. Some of the birds that will nest in this box are American Kestrel, the Great Crested Flycatcher, Wrens, Chickadees, Nuthatches, Titmice, Swallows, and Woodpeckers. We build the Pastel Blue Bird House in our workshop out of cedar. The whole bird house is hand painted light blue. 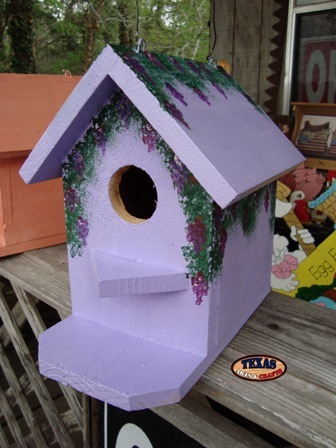 The size and colors may vary slightly as the bird house is handmade. Some of the birds that will nest in this box are American Kestrel, the Great Crested Flycatcher, Wrens, Chickadees, Nuthatches, Titmice, Swallows, and Woodpeckers. We build the Pastel Green Bird House in our workshop out of cedar. The whole bird house is hand painted light green. 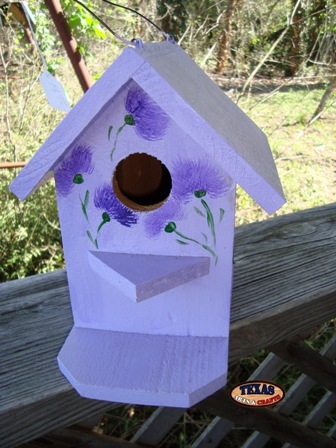 The size and colors may vary slightly as the bird house is handmade. Some of the birds that will nest in this box are American Kestrel, the Great Crested Flycatcher, Wrens, Chickadees, Nuthatches, Titmice, Swallows, and Woodpeckers. 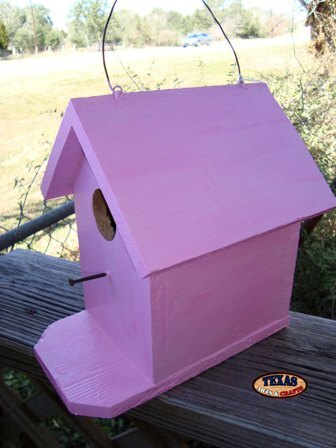 We build the Pastel Pink Bird House in ours workshop out of cedar. The whole bird house is hand painted light pink. The size and colors may vary slightly as the bird house is handmade. Some of the birds that will nest in this box are American Kestrel, the Great Crested Flycatcher, Wrens, Chickadees, Nuthatches, Titmice, Swallows, and Woodpeckers. 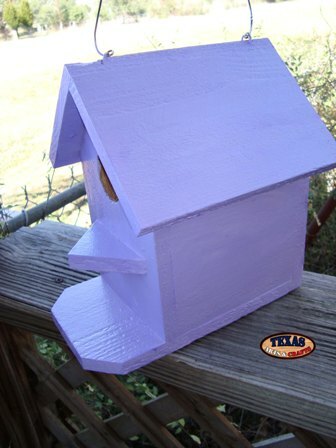 We build the Pastel Purple Bird House in our workshop out of cedar. The whole bird house is hand painted light purple. The size and colors may vary slightly as the bird house is handmade. Some of the birds that will nest in this box are American Kestrel, the Great Crested Flycatcher, Wrens, Chickadees, Nuthatches, Titmice, Swallows, and Woodpeckers. 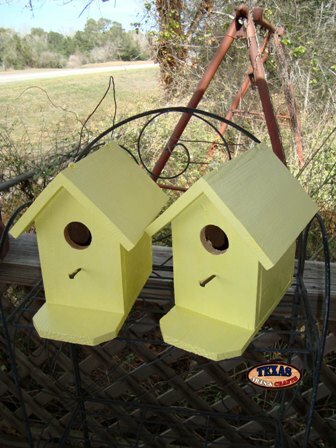 We build the Pastel Yellow Bird House in our workshop out of cedar. The whole bird house is hand painted light yellow. The size and colors may vary slightly as the bird house is handmade. Some of the birds that will nest in this box are American Kestrel, the Great Crested Flycatcher, Wrens, Chickadees, Nuthatches, Titmice, Swallows, and Woodpeckers. 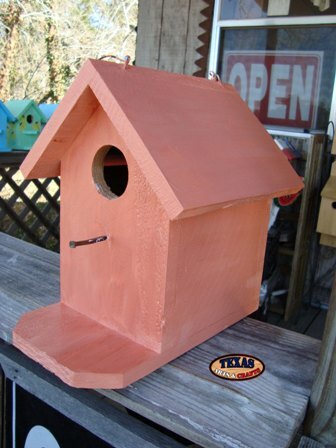 We build Pastel Red Bird Houses in our workshop out of cedar. The whole bird house is hand painted light red. The size and colors may vary slightly as the bird house is handmade. Some of the birds that will nest in this box are American Kestrel, the Great Crested Flycatcher, Wrens, Chickadees, Nuthatches, Titmice, Swallows, and Woodpeckers.